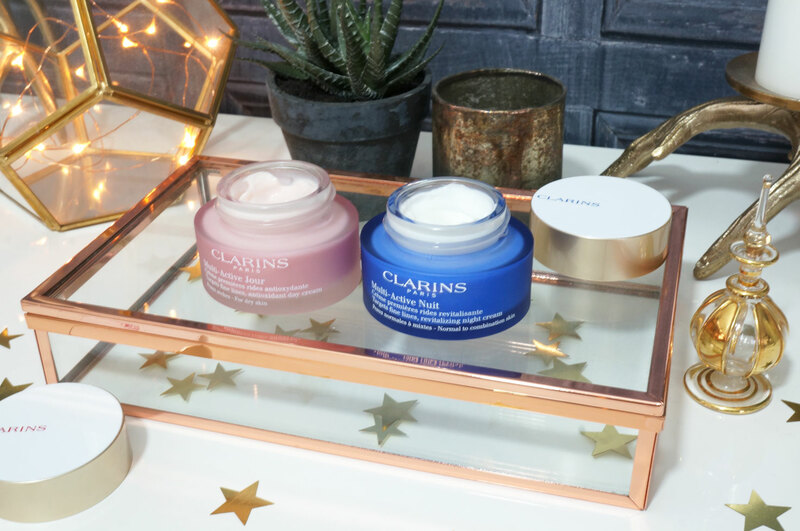 One of my favourite beauty brands, Clarins is back on the blog today, and this time with a couple of brand new skincare products. Their new Multi-Active day and Night Creams aim to visibly diminish the first signs of ageing, restore radiance, hydrate as well as maintain younger looking skin. 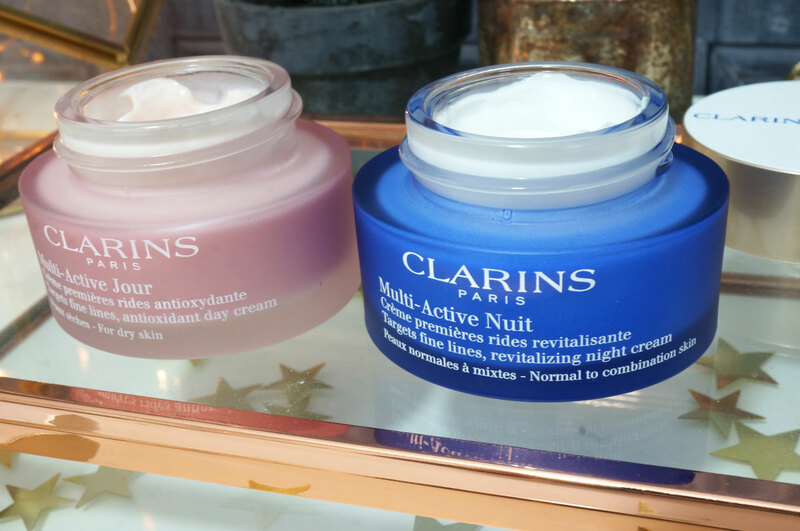 Clarins describe them as ‘Multi-tasking skincare’, designed with your busy lifestyle in mind. There are four day creams – one for all skin types, one for dry skin, one with added SPF20, and a also a light weight SPF15 lotion. For evening there are two options available, a standard night cream for dry skin, and a lighter version for normal to combination skin. It’s great to hear that Clarins really have done their research when creating these products. They started off by asking women across the world aged between 30 and 39 what they thought affected the appearance of their skin the most – and they found lack of sleep and stress were the most popular responses. Clarins’ own research has also proven this to be true. They found that stress and a lack of sleep can lead to an overproduction of free radicals which affect the main cell responsible for youthful skin: the fibroblast. This cell ensures the smooth, toned look of the skin due to its production of collagen and elastin fibres, so when it becomes worn out due to lack of sleep or stress, we start to notice the first visible signs of ageing, including fine lines and a dull complexion. 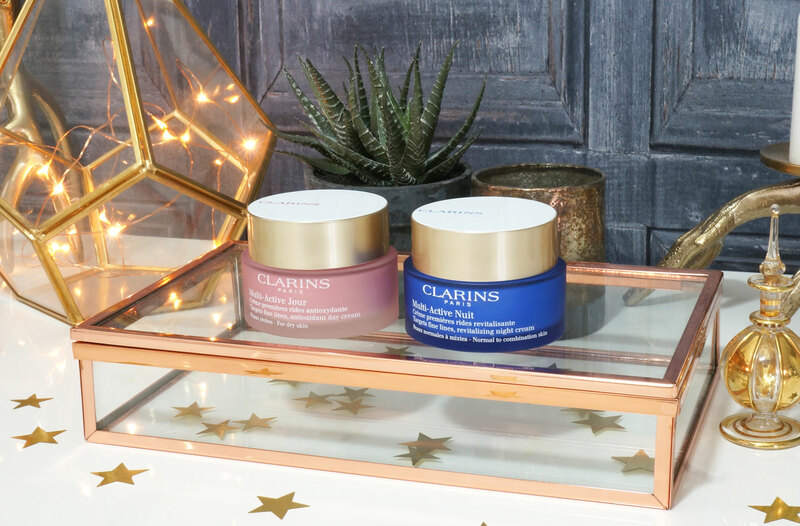 To give the Fibroblasts a helping hand, Clarins have used cutting edge technology to harness the power of plant extract Teasel, which has been selected to revitalise and protect tired and stressed skin by encouraging the production of ATP, an energising molecule, which also helps to fight free radicals. I have the Multi-Active Day Dry Skin Cream – this is specifically designed for dry skin, helping to prevent and visibly correct the appearance of fine lines, thanks to the new organic Myrothamnus extract. The Myrothamnus plant originates from South Africa, and in the dry season the plant’s cells produce a substance called trehalose which allows them to rehydrate. In turn this helps protect dermal cells from harmful effects of stress and to keep skin smooth and radiant. The Multi-Active Day Dry Skin Cream has a wonderfully hydrating formula that melts into the skin. It’s also enriched with light-reflecting ‘radiance’ pigments to illuminate and hydrate the complexion, and has a subtle-floral fragrance with notes of cherry and white lily, to revive and refresh. I also have the Multi-Active Night Cream – this contains organic California Golden poppy extract, which helps to offset the damaging effects of late nights and interrupted sleep – this sounds perfect for me! To explain this a bit more- at night, the skin fights damage caused by stress by producing a hormone called melatonin. Due to interruptions in the sleep cycle or a reduction in the length of sleep, this process is disrupted, meaning lower amounts of the hormone are secreted and damage intensifies. The Golden poppy extract helps to stimulate the synthesis of collagen and fight the harmful effects of free radicals in the skin, helping skin to become visibly smoothed and more toned upon waking. So the idea is that you apply this before bed, and wake up with smoother skin and redefined features. The Multi-Active Night Cream also works to prevent as well as correct the appearance of fine lines, whilst nourishing and hydrating the skin. I also want to mention the lovely calming and relaxing fragrance which is perfect for bed time. It includes notes of jasmine, freesia and heliotrope to help soothe the mind. Both creams are lightly scented and feel thick and luxurious, and I love that they both sink into the skin really quickly leaving no residue. I must say I think the Night cream is my favourite though, I’ve used it a few times now and I always wake up with super soft skin the mornings after using it. 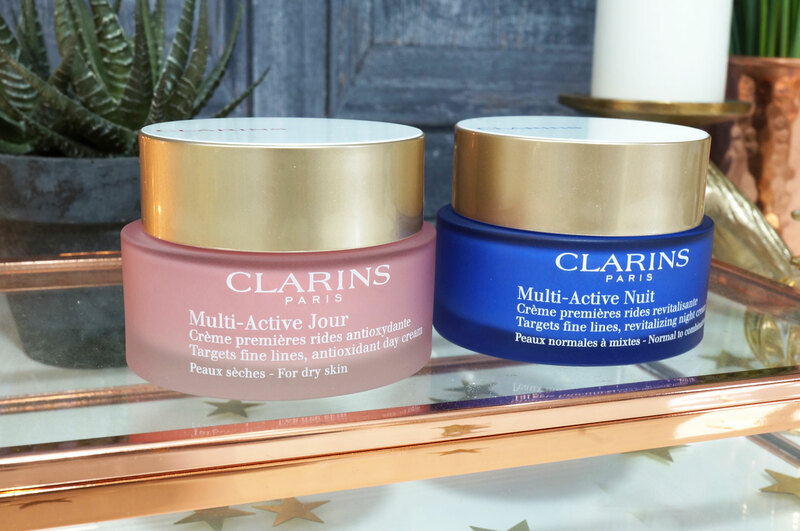 Clarins Multi-Active Day and Night Creams are available to purchase now from House of Fraser. What’s Cooking in the LUSH Kitchen?